If you’re anything like me, what you need after some particularly drudge-ful drudgery is entertainment that doesn’t just pass muster but pushes the bar higher. The kind that can combat the effects of tasks as tiresome as completing expense reports. Oh, boy. What a task. To be fair, it’s been made a tad easier for me because I’ve been issue with a fine piece of software to deal with it. I won’t name it here, however, as a matter of discretion with which I’m sure you’ll concur. Let’s just say that, like most fine software, it works well when it works and drives me mad when it doesn’t. To raise my spirits takes something out of the ordinary. What better than fine standup comedy? Especially standup by women. And specifically Jewish women. I have two fine examples, one fictional, one real. First the fiction. 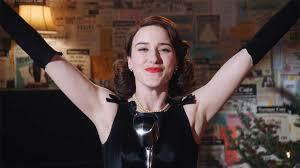 We watch quite a few shows, but this year none, I feel, has been as good the recent Amazon series, The Marvellous Mrs Maisel. At times, I come across writing that simply makes my jaw drop, and this series was full of such moments. “How did she think of that?” I kept asking myself, bowled over by the talent of the series creator, Amy Sherman-Palladino. Set in 1958, the series tells the story of a wealthy New York Jewish wife and mother, Miriam ‘Midge’ Maisel, who finds herself increasingly drawn into making a career for herself in standup. The framing story is peopled with a range of highly distinctive but entirely Jewish characters each played by an excellent actor (Kevin Pollak is outstanding as the sweatshop-owning father-in-law), all of them endowed with their own skilfully comic lines. Their story is chaotic, noisy and even subversive of its own genre (the severe paterfamilias, for instance, comes across as genuinely authoritarian until we discover he seldom gets his way). In powerful contrast, the standup sessions, and there is at least one per episode, while seeming even more anarchic than Midge’s life, are highly disciplined, tightly timed, and perfectly paced. Each is a jewel of the art. How about the real comedian? We saw her a few weeks ago at our local, council-run comedy venue, the Luton Comedy Bar. It charges a ridiculously low amount to get in, which means it must pay its artists a pittance. You wouldn’t tell from the quality, though, which was of the finest – the best value for money for entertainment I can think of. The headline artist was Daphna Baram. She introduced herself by pointing out that we would all know from her accent (Israeli) that she wasn’t from around here. That was one of her least successful lines of the evening, not particularly appreciated by an audience of Lutonians who don’t sound that different from people from Walthamstow, only 35 miles away. But I enjoyed comparing the Walthamstow and Luton accents with hers, which was nothing like either. 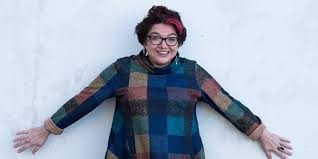 Baram has an extraordinary background: a former human rights lawyer as well as a former soldier, she apparently took up standup when friends bought her a comedy course after she had a heart attack. On the evening we saw her, she told the audience that she had just learned that she’d been successful in winning British citizenship (or is that subjecthood?) Taking the test meant learning a great deal more about Britain than most native Brits know. For instance, Jewish or not, she had to learn all about Christmas. And what gets her about that festival? Well, the serving of turkey, the dullest of meats. Cautiously a few voices volunteered the answer “Bethlehem”. It seems that Baram has been there several times, and not always with an Israeli Defence Force tank. And in that town she came to know an outstanding restaurant that served superb lamb dishes. Sadly, the restaurant has since been razed by the IDF, but its signature dish remains the main specialty of the town. “Jesus would have been a lamb eater,” she assured us earnestly. A line as good as any of Maisel’s. And as good an antidote to hours of drudgery as any drink. However stiff it may be.